One school year, a very long time ago, sometime in the late 90s… I remember I planned a lesson on the class environment, furniture, the use of class materials and why we have them in school. It was at the beginning of the year and it was to help me and my co-teacher discuss how we take care of our class as a community. It turned out to be a very interesting topic and I wish HGTV was as popular then as it is now. But HGTV was a very new concept – in fact, I believe at that time it was called Home, Lawn and Garden. So, my children didn’t have many references other than their house or the homes of family members and friends. I made sure they were really familiar with their classroom furniture and materials by the end of the lesson. For months, we discussed the importance and why it’s important to take care of our furniture and materials. We even tied it to the topic of recycling and repurposing to cut down on waste. To my surprise, the children really listened and followed our guidance – they worked as a community. They pointed out how they needed trays or poster board to protect the tables when they used drawing or painting tools. They pointed out how they should place containers on the shelves gently so that it doesn’t scratch the surface. They even asked for soap and water when they noticed dirt or dust so that shelves, toys and materials remained clean. We hosted pretend auctions and class furniture sales so that children could help to rearrange and repurpose materials. And parents were excited to bring in items from home that they no longer needed. Several standards were covered in Science, Social Studies, Math, Language, Personal Social, Physical Development and Emotional Development (I pretended to cry when we auctioned off my favorite basket to my co-teacher… the children were moved by my emotion and so they problem-solved ways to buy it back). Speaking of problem solving, there were several opportunities to work on that skill. The children practiced using their imagination by thinking of ways to use materials creatively and in multiple ways. We looked through magazines, home photos, made comparisons to furniture and materials outside of school that were familiar to us and involved other teachers, staff and parents that wanted to participate. Overall, the lesson helped to build school-wide awareness of how we take care of our home and school environments. Many of you tie your specific themes or lessons to books and there are several books that you could use with the lesson(s) I just mentioned. I can’t recall all of the books I used with my topic because it was so long ago… but I do remember one. 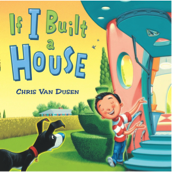 If you’re wanting to help children think about their class physical environment and the materials they use, here are a few books that you can find through Scholastic or Amazon to enhance your children’s experiences on the topic. The word I would use to describe this book would be… delightful. You could use this book to share with children the importance of everything in the classroom and how they should be thankful to have a safe, fun and active place to learn each day. Point out how the young child talks about furniture, pets, materials and ask why they think the young child is so happy and appreciative to have these things. 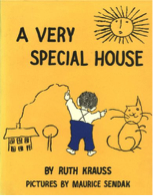 Ruth Krauss is the author of The Carrot Seed and Maurice Sendak is the illustrator for Where the Wild Things Are. So the combination of these children book legends will always produce a unique and imaginative child’s perspective. If you think about it, lots of classic fairy tales involve characters that use furniture or materials in interesting ways. I tied my lesson to familiar fairy tales and I remember one of the books was Goldilocks and the Three Bears – A Tale Moderne by Steven Guarnaccia. This book is very special because it allows you to expose children to art and furniture styles that are displayed in magazines, museums and perhaps their homes. You can even go a step further to expose them to different artists, art styles and colors. 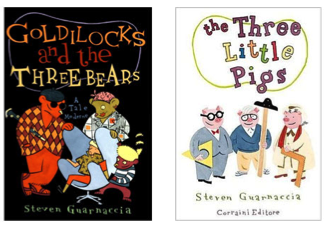 Steven also modernized the story of the Three Little Pigs which can be used to expose children to famous architects and architectural styles. It’s fun to introduce new vocabulary words and concepts that they will most likely see again as they continue their schooling. Children would love to be able to reread and picture-read these books over and over again. Make sure you place them in your book area and revisit activities and class pictures throughout the year. Your class furniture and materials will benefit from your effort to support children as they take care of their classroom as a community.